With a fresh lemony flavor, these delicious lemon pull-aparts are perfect for celebrating Mother's Day at breakfast, brunch, or coffee time. They are soft and yummy but so easy to make. 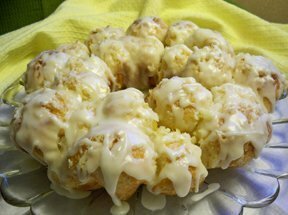 Mom will appreciate the light and lemony flavor of these pull-aparts on her special day. Simple frosting designs to give your cake the perfect finishing touch for Mother's Day. See step-by-step instructions on how to make Belgian waffles for a special Mother's Day breakfast or brunch.